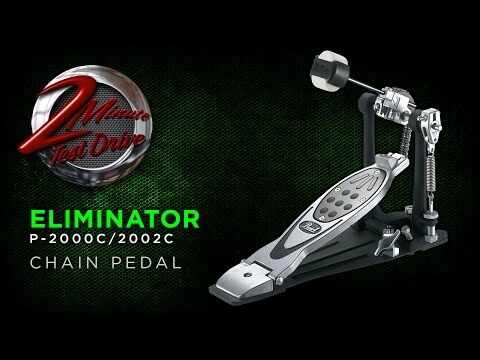 Our revolutionary PowerShifter function provides 3 positions to fine tune the power and feel of the pedal. By moving the footboard forward or back, you change the chain or belt drive angle, thus changing the leverage to create a light, regular, or strong feel. The PowerShifter Eliminator’s Traction Plate footboard insert allows you to remove and reconfigure each individual traction grip to suit your exact playing requirements. From maximum grip to full slide and everything in between, the choice is yours. The Traction Plate also reverses to focus the slide or grip surfaces to either the toe or heel of the pedal. Our stainless steel hinge is manufactured with incredibly precise tolerances to prevent play between the footboard and heel, yet provides maximum freedom of motion for blazing speed. Our Roller Cam Hoop Clamp multiplies each turn of the adjustment knob to speed the process of attaching the pedal to the hoop. It fits an extremely wide range of hoop thicknesses, and offers the smoothest, most secure grip possible. Our counter spring has been designed to perfectly compliment the weight and balance of the footboard and beater assembly. It also offers a much wider range of adjustability, allowing you to fine tune the pedal tension to suit your playing style. Our Uni-Pressure Spring Clamp System grips a full 360 degrees, and allows infinite beater angle adjustments. Featuring a unique Floating Spring Pendulum design that is perfectly centered on the clamp, this system offers full precision bearing movement for unmatched smoothness. Our QuadBeater provides four different beater surfaces, each with its own distinct sound. You can choose from 2 hard plastic surfaces or 2 felt surfaces, and either pinpoint or line contact with the head.